CES 2011: Polk debuts CHT500 SurroundBar system | What Hi-Fi? It comes with a SDA (Stereo Dimension Array) control module (pictured) which connects to a multichannel amplifier's seven- or five-channel speaker outputs to handle all the signal and crossover processing for the SurroundBar CHT500, which in turn is hooked up to the SDA unit using the supplied 15ft cable. The SurroundBar itself is less than 1in deep and is housed in a 49in wide black extruded aluminium enclosure. Inside are three Polk tweeters and nine proprietary Polk Starfield anodised aluminium dome 3in mid/bass drivers. 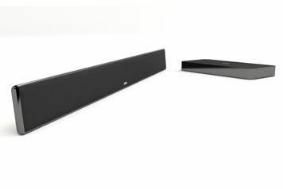 When paired with a Polk wireless subwoofer, the SurroundBar CHT500 and SDA module "provide a high-performance music or movie experience with the minimum of clutter", the company claims. Polk adds that its Stereo Dimension Array surround technology combines digital signal processing and acoustical geometry to create "an enveloping sonic experience".